Meet the Beatles for Real: Time to hit the beach! I wish all of you (U.S. readers) a happy Memorial Day! I hope you all enjoy a day of good food and time with family. 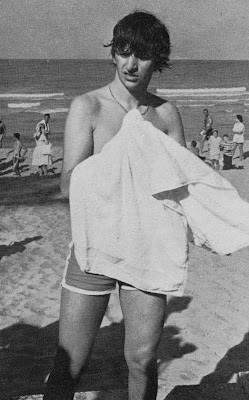 I also hope that as the weather gets warmer many of you get to be like Ringo here and have the chance to hit the beach or the pool. This Memorial Day I want to especially remember the father of one of my students this year. His Dad fought in Afganistan and is no longer with us. This student got me a Beatles book for Christmas this year. I want to remember James Smith and thank him for being part of a bringing a great little guy into this world on top on top of being a hero. He is missed by his family and since I try to remember someone specifically each Memorial Day, I wanted to mention Mr. Smith this year.